Here is your Angel Card Reading & Channeled Message for the Week of 10/15. For this week’s message, the angels took me right to the always amazing and powerful Energy Wisdom Oracle Cards by me! (I channeled them — here’s a link: http://www.dinakennedy.com/oracle-cards-by-dina/), I heard to pull one card for you, but 2 came out together! So 2 it is. Why? Because when one attaches to the other so strongly, they are both part of the message to be delivered. And you’ll see in the reading and channeled message, that these 2 cards work beautifully that way! 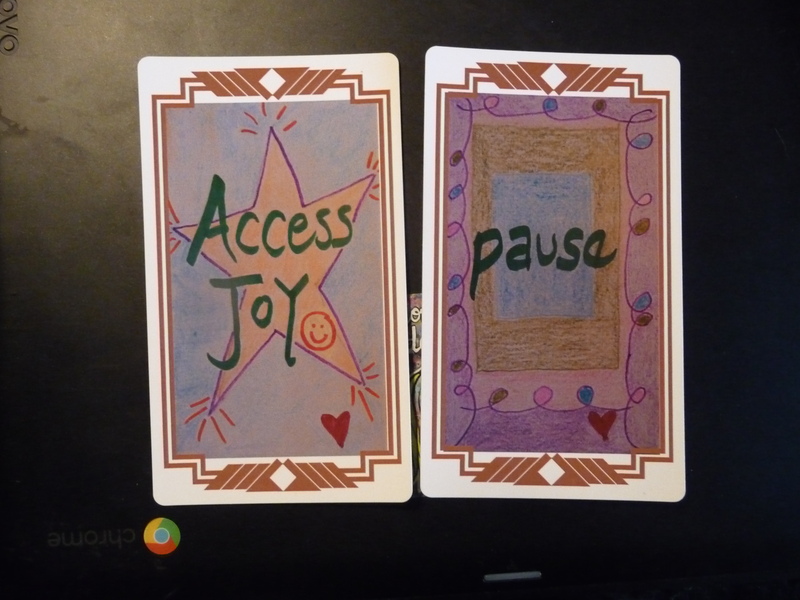 Card 1 is ACCESS JOY. Are you rusty? Have you’ve forgotten to give time to JOY? It’s not as loud as stress or chaos, is it. It’s something that’s easy to let slide to the side as we go about our days. But it’s oh so important to reconnect to now, dear ones. Where to start? Start with gratitude and appreciation for what’s already here! What’s one good thing going on in your life right now? Focus there, allow yourself to feel grateful, really feel into it, and turn the JOY on. It’s in there — you’ll find something. That JOY of yours is just waiting for you to reconnect, to become aware of it once again, to feel its energy, its vibration, its flow, its brightness. What’s going well for you, right now? What’s something good, today? What might you put your focus on to access your Joy? Take a minute, right now, and go there. Jut go there. Take a breath, and feel the joy. You’ll be so glad you did. And this leads right into Card 2 — which is PAUSE. Yes, PAUSE. If you are having trouble finding things to feel grateful about, if you are having trouble accessing joy, if you are struggling with life, with stress, with overwhelm, the quickest way to regroup is to simply PAUSE. Now this would be a pause of non-doing, dear ones. No cell phone or ipad, no mobile device computer or tv, no conversations or headphones. Just be. Just take a PAUSE and simply be. Can you Pause for a moment of just BE-ing, dear one? Just Pause, come into the now, let go of all else just for a few breaths, access joy, and shift into your Light now. You can do it — it isn’t hard to shift in this way — and remember, you can always call on your angels for help with this! Just ask them, and they’ll be there. Pause, breathe, Access Joy. Your assignment for this week. Put it in your calendar!